Political realists are accustomed to argue that ethical considerations have no place in public affairs. This is always a debatable view: realism habitually employs a crude utilitarian morality rather than being totally amoral, and ethical considerations have continued to play an ever more prominent role in the thinking and actions of policy makers and politicians. In addition, citizens increasingly expect policies not only to be efficient and effective according to some purely economic or prudential calculation, but also to be equitable and just as well. As a consequence, both the public and private morality of politicians and public officials has come under ever greater scrutiny. The essays collected together in this volume explore the ethical issues raised by the process and substance of policy-making, and discuss whether it is reasonable to expect ethical standards in public affairs. 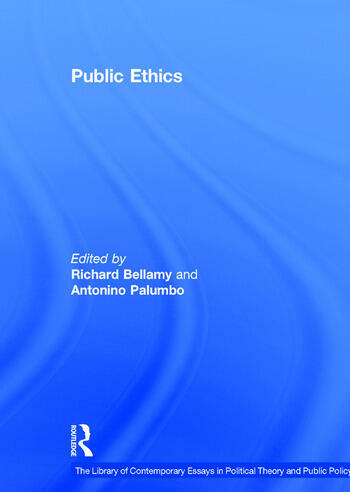 Contents: Introduction: the subject, approach and distinctiveness of public ethics, Richard Bellamy; Part I Dirty Hands: Political action: the problem of dirty hands, Michael Walzer; Dirty hands, Martin Hollis; The moral importance of dirty hands, Anthony P. Cunningham. Part II Violence: Liberal democratic torture, Steven Lukes; Why is violence bad?, Vittorio Bufacchi; Torture, Henry Shue. Part III Professional Ethics: Professional detachment: the executioner of Paris, Arthur Isak Applbaum; The philosophy of codes of ethics, L.L. Fuller; Moral responsibility in professional ethics, Gerald J. Postema. Part IV Corruption: Defining political corruption, Mark Philp; What does corruption mean in a democracy?, Mark E. Warren; Political corruption and democracy, Susan Rose-Ackerman; Mediated corruption: the case of the Keating Five, Dennis F. Thompson. Part V Public Reason, Lying, Secrecy and Privacy: The scope of public reason, Jonathan Quong; The right to lie: Kant on dealing with evil, Christine M. Korsgaard; Democratic secrecy, Dennis F. Thompson; Can public figures have private lives?, Frederick Schauer. Part VI Cost-Benefit Analysis and Moral Absolutes: Risk, fear, blame, shame and the regulation of public safety, Jonathan Wolff; A place for cost-benefit analysis, David Schmidtz; The stupidity of the cost-benefit standard, Henry S. Richardson; Name Index.